I have a paralyzing fear in games with open-ended, sandbox character development that I will put hours and hours into a character and then realize that I made a character that isn’t viable, or that I just don’t like. Yes, skill resets are a thing in most games, but they’re usually pretty expensive, especially around mid-game where problems start to show themselves. 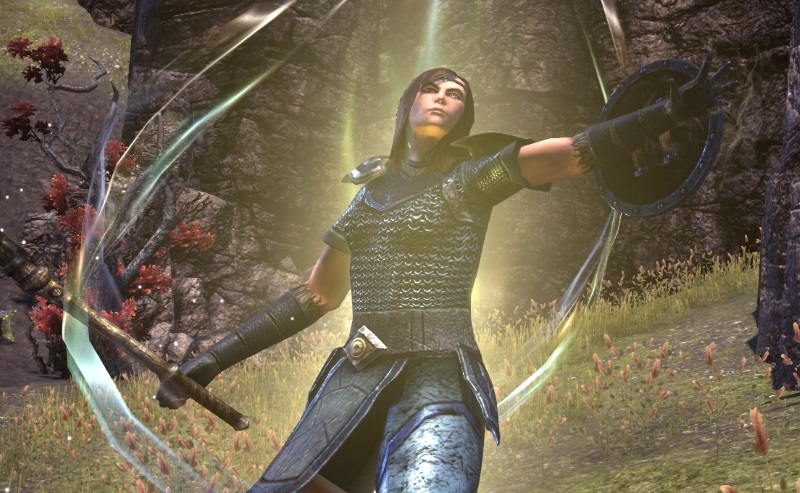 I’ve talked about this before with Rift, and Elder Scrolls Online is no different. I’ve been toying with this title for a while, but I’ve been put over the edge by the upcoming housing, which looks great. My go-to play style in MMOs has always been to be DoT-focused. I started with a nightblade with a focus on bleeds and inferno staff, but I quickly realized that I was actually killing stuff faster if I just spammed one of my direct damage attacks. If I’m noticing this at level 7, is it going to get better as I run into enemies with more health, or will it just get worse? I did some Googling and found that many players were saying that DoT damage in TESO is pretty much crap; something to supplement your damage with, not to focus on. So I thought maybe I’d try a summoning sorcerer. Pets are basically DoTs with health bars, right? Well, pets are also crap, apparently. So I started poking around what is viable, and I found a templar healer/tank hybrid called Atlas that sounds really interesting to me. The description says it’s not good for Trials (raids), but that the author was able to 2-man some veteran dungeons with a DPS, which sounds more fun to me anyways. I know some of you are thinking “You’re relying too much on other people’s opinions! Just play what you think is fun!” I know you’re thinking it because I would be thinking it too, and it made me feel a bit guilty at first. In most games, I’ll play my character in whatever way seems fun, then, when I hit the level cap and think about endgame content, I look up a build guide. I generally don’t follow them strictly, but these people have generally put a lot of theorycrafting and experimentation into their builds, so it would almost be dumb not to at least look at it. And, in Elder Scrolls Online’s case, I’m making decisions at the beginning of the game that will affect how my character plays at endgame (skill points and attribute points), before I have any idea what works and what doesn’t in this game. It’s really nice to at least see what other players are doing to at least confirm or deny that something I’m doing is worth my time. Again, I probably won’t follow any particular guide to the letter, but there’s a certain amount of comfort in having something to use as a baseline in a game with so much freeform character development. So thanks to Deltia and everyone else out there who writes guides for noobs like me! I started up Elder Scrolls Online myself not that long ago and am currently at mid-game (I think… 3 zones in, level 35 or so) with a Templar Dual Wield/Restoration Staff character and… yeah… I don’t kill things fast at all, but I am finding my survivability to be pretty good. However, do I make a good DPS for groups? Most likely not. Do I make a good healer for groups? Also, probably not. So, although I’m having an okay time with the character, I don’t feel like I can participate in group dungeons successfully unless it’s as an off-DPS (is there such a thing? ), or an off-healer. The illusion of choice is very strong in TESO, moreso than most, and I can definitely understand being hesitant to jump in for that reason. Its funny you mention Deltia. I was watching him running a tanking build dungeon guide on youtube this week, and he was jumping off cliffs shortcutting content and speaking so nonchalantly about how easy the dungeon was because od fis build – he looked and sounded bored and boring. I stopped the video. From everything ive readyou have more skillpoints then you need at level 50 anyways. So yea the guides are helpful but one patch can undo all that anyways – might as well follow a playstyle thats makes you happy.